This tree is loaded with Made In Japan flocked goodness. Wouldn't you love to stand in the shoes of one of those Japanese designers that worked in the factory where they made these flocked ornaments? Knee hugger elves are a perennial favorite. For this tree FUN and FLOCKED is the theme. Oh yeah, felt and sequins too. 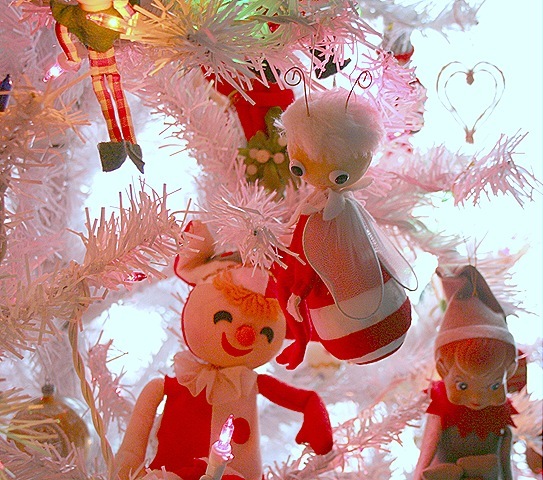 If you want lots more vintage christmas goodies just drop over here to Joan's blog, Anything Goes Here for links to blogs highlighting their vintage christmas collections. ta ta. I just love this!!!! I was never a fan of white trees but next year I am getting a little one with multi colored lights so I can do something as cute as this! Great ornaments! This is fabulous. I could spend all day looking at all the fun kitschy goodies! Amazing how good they look in abundance like that! The white tree is perfect. What a great retro” tree. It’s so cute and colorful. I still can’t believe you have 8 trees. Do we get to see more of them? Hope so. I LOVE both of your trees. BEAUTIFUL!!!! I love the silver one and it’s theme and also the white one!! 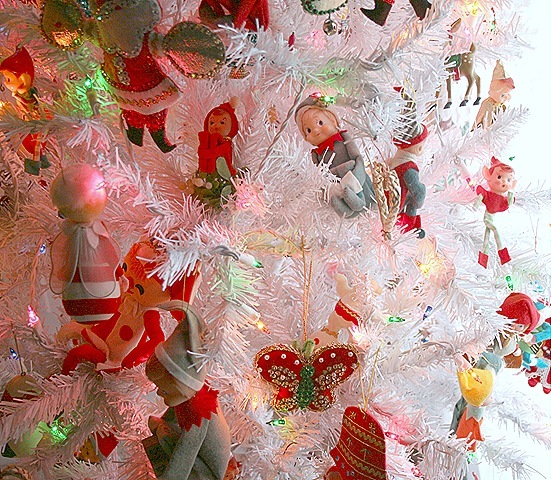 You are lucky to have so many ornaments to go with each tree. It is not easy where I am to find so many vintiage items. 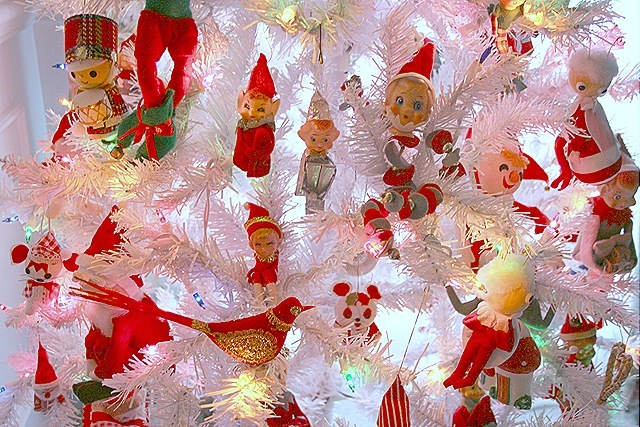 I love the elves on your tree and I do have a few of them on my feather tree. I had never heard them called Knee Huggers before. Love it!! I hope there is more coming with your trees!!! Total enjoyment for me. And I thought the aluminium tree was my favorite. This is a total throwback to my grandma Millie’s tree. Wait ’til you see my banner…. 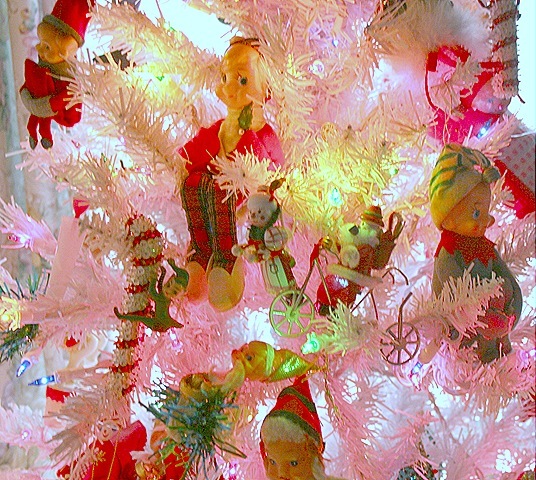 I have a tinsel tree that is filled with “Made in Japan flocked goodies”….”Fun, flocked, felt and sequins too”. I am so using your description for my tree. I also love the Merry “Kitschmas”. My tree I call the “1960’s” tree everything on it predates 1960 the year I was born. 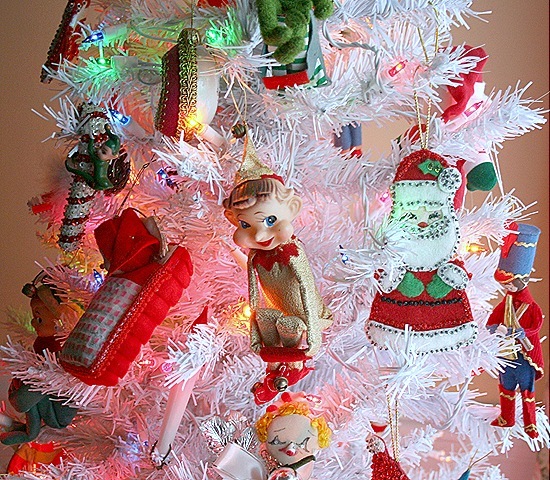 Most of the ornaments are from the 40″s. If you would like to take a peak, that tree was on the Nov 29 Vintage Christmas Post.